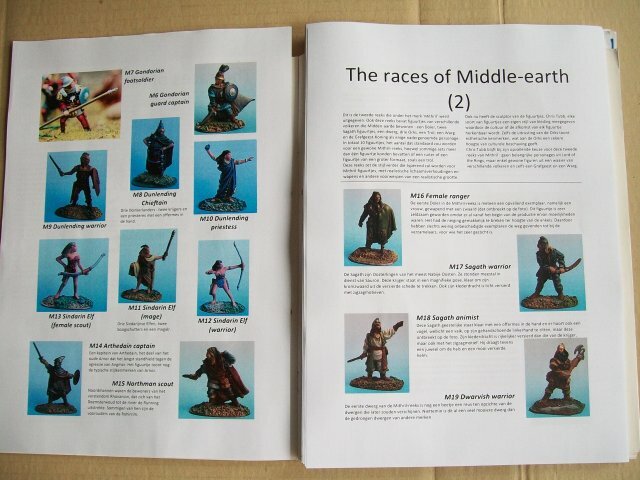 Mithril once published a catalogue with pictures of their Mithril ranges, but this catalogue was not complete. For example it started immediately with M83. So I decided to make my own pages and here they are! That do look very fine indeed, Master Gerold. I tried to do the same for myself- in black and white in this case- due to the second catalogue from mithril. But that is still inclompete. Interesting to see in your work, Master Gerold, are the text parts. Did you write those text passages for yourself or . . . ? This is really a cool and great work Master Gerold. I am very impressed and as master turambar, I wonder if you wrote text passages for yourself or... ? . That would be kind, Master Milo. 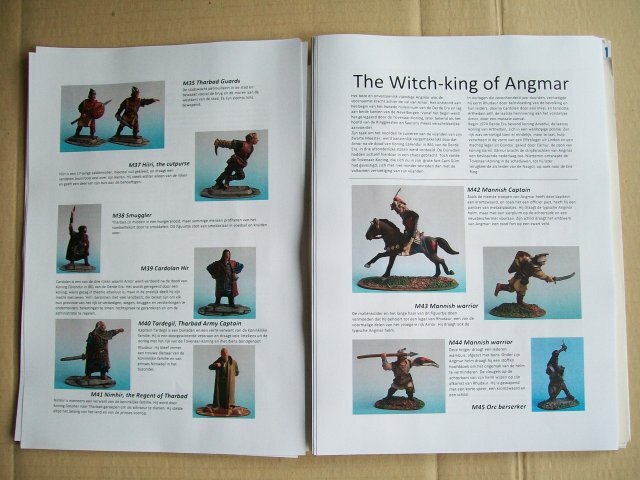 I'm sure you remember that I'm very much interested in catalogues about Mithril miniatures. You certainly should do so, Master Milo . . .
Oh: about those textes I remind on your "dragon-magazine-scans", Milo, do you remember- those advertise sheets you sent me long time ago . . .
Maybe there is a similar text to find . . .
Do you have a French version at the bottom of one of your drawers? It was also interesting for me because I had to do some research, f.e. who were the Sagath ? What's an Eothraim Prince ? What is the origin of Rohan ? What's the history of Tharbad and where do these Mithril characters come from ? Believe me or not, but many of these things I simply did not know. I was only interested in the main stories and of course the beauty of the figures. I don't call myself a M-E specialist now, but I've learned a lot doing research for these pages. Ah- thanks for the explanation, Gerold. And Milo- thanks a lot for sharing these treasures too!!!!!!! There seem to be a lot of hidden mithril-related stuff around. 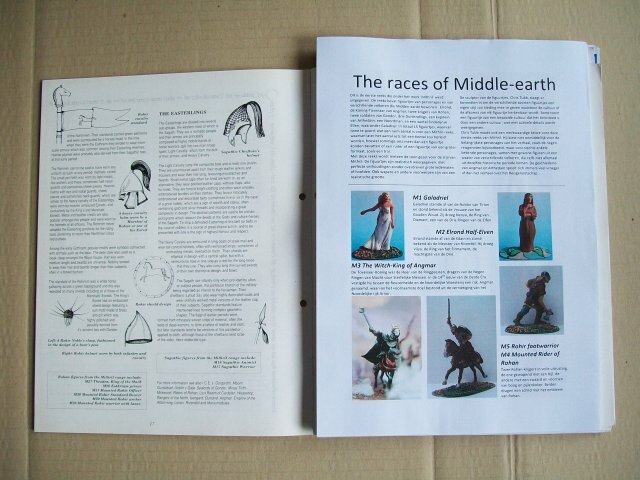 Interesting beneath the colour scheme are the photographs of early mithril figures in a very fine quality. I would be very interesting in these sheets- always on the hunt for fine photos- as you know . . . and I would be pleased if you can send them to me. A drink for Master Milo please! And Milo those are some terrific relics! I have made a translated page for the first range of miniatures, but can someone give a good suggestion for a way to share it here ? It's a word-document, so posting in the gallery doesn't work. I have learned throughout many years that PDF is the most common data for text files . . . Indeed, pdf is a good solution. Another solution is jpg but no search is possible in the text. Well, as far as JPG format is concerned I have a serious doubt about the quality. 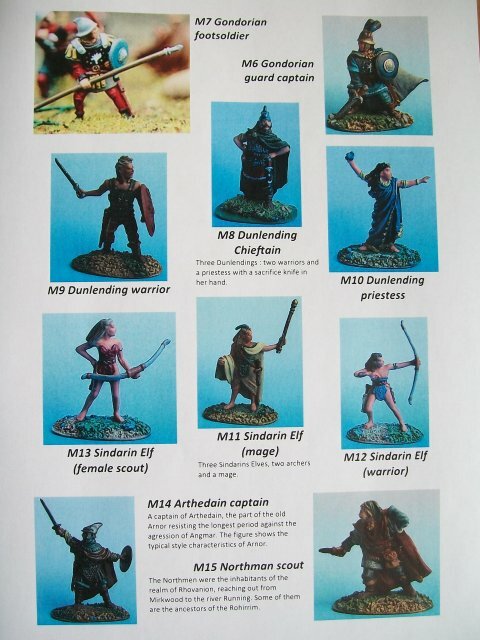 I just have to have a look at the photgraphs taken from the minis . . .
As far as Master Zoetrop´s work is concerned I think you have to ask Master Zoetrop for publishing it here, Master Milo! The other question: is there really anybody out there WITHOUT knowledge of Zoetrop´s catalogue? I am not sure if I know which is that catalogue your are talking about. 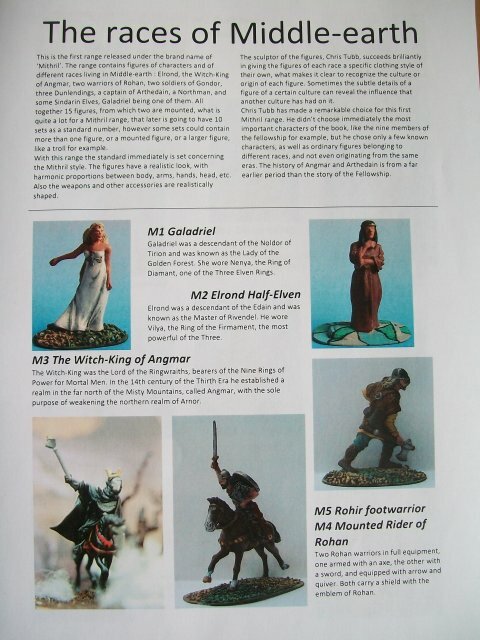 I have a catalogue marked as mithril 2010 catalogue and collector's guide with a lot of pages with all miniatures from m1 to ms563, that I think corresponds to the one you were talking about. Am i right? So you are talking about two completely different catalogues here. Concerning Herbert's catalogues I think Turambar is right suggesting to contact Herbert and ask him before providing his catalogue here on MMP. I was a bit involved in those two catalogues and from that time I remember well that Herbert did not want to have it published here. Master Theobald said: "So you are talking about two completely different catalogues here." I often notice that some fellows "dilute" some threads with different or similar matters. Maybe I can suggest to open for Master Milo´s treasure a seperate one. Master Gerold will be thankful, because this is "his" catalogue page . . .
As far as Master Zoetrop (Herbert) is concerned I do know exactly about this too. Namely that he doesn´t want it to be publihed here! Thankfully Master Tree mentioned that. Posting his work here could be the start for some "complications"
Well, it is my intention to make the missing pages. 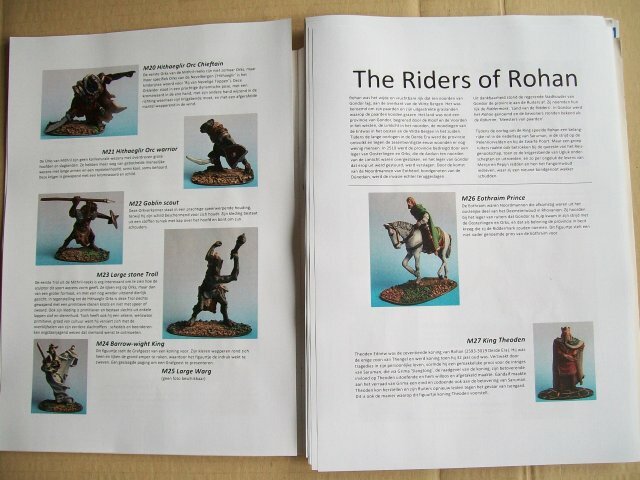 So far I made the pages for the first 5 ranges (Witch-King of Angmar was the last one). 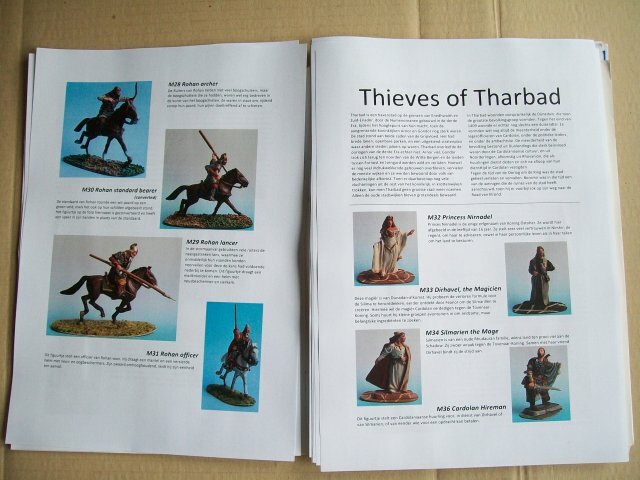 But I plan to make also pages for the next ranges (Shire Folk is first next). And I'm translating the first pages in English now (I originaly wrote them in Dutch) so you all can read the text if you want. And eventually make suggestions for improvement as I know there are many helpful people around here:). Master Milo- I have to confess, that I am still interesting in those scans of your small catalogue . . .
Master Gerold, I love the work you have done. It's always a great feeling for me to see first mithrils painted as it reminds me of times when I was still a kid, dreaming of all these best minis I look at in the shop in Paris. Yes, Master Milo, I know what you mean. Me too, when I'm painting an early figure, it feels like being 25 years back in time.